For those who love history of racing cars and the gorgeous beasts creating them are angels creating your dreams, here is a treat from Jaguar, six more models of Lightweight E-Type with same specifications. Made from aluminum the Jaguar Lightweight E-Type is lighter than the standard E-Type and features everything a classic racer will look for. What to know about them keep scrolling to have a detailed overview of this all new member rolling through sands of time. Interior of Jaguar Lightweight E-Type 2014 features lots and lots of aluminum work and race spec parts which more or less hold their roots in original Lightweight E-Type model. Three spoke wood rim steering wheel is placed in front of aluminum bucket seats with padded cushions and five point seat belts. Beside are placed aluminum knob and handbrake. A clear laminated windshield replaces the regular glass house while adding to safety is placed a fire extinguisher in front of the passenger seat. In all we found entire interior of Jaguar Lightweight E-Type 2014 inspired by the standard model with few changes that give it a mark to stand in this fast growing market. However looking at company’s intentions they just want to touch the limited race car lovers with this interior. 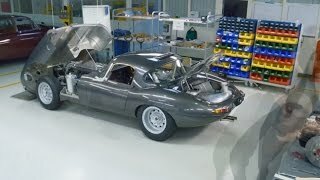 Let us have a look at the exterior of Lightweight E-Type. Exterior of Jaguar Lightweight E-Type 2014 is built with the same specification as that in its 1963 race car. You may call this a mirror creation with use of modern technologies. 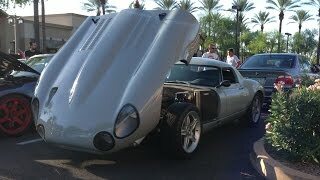 Entire body is created by using aluminum and the beautiful sculpted lines are still the same. While the aluminum works glorified doors, trunk lid, hood, and the hard top, parts like fuel cap, release handles and bonnet air inlets are true copy of their ancestor. The six models do created are entirely handbuilt by professional at Jaguar who took utmost care that this present model in doesn’t loses the any way essence of past. Jaguar Lightweight E-Type 2014 will come in six heritage colors including Carmine Red, iconic old English white, British racing green, silver metallic and opalescent grey metallic. 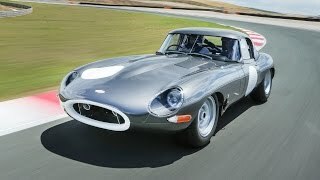 To keep the cues from the original model, Jaguar Lightweight E-Type 2014 houses six new 3.8 Liter six-cylinder engines delivering total output of 340 HP and peak torque of 380 nm paired to four-speed transmission.